Venus Metals (ASX:VMC) is armed with an impressive arsenal of exploration projects, spread across a diverse range of base and precious metals. Backed by rising zinc and copper prices, VMC has just started drilling in the southern target area at its Youanmi Pincher Well zinc-copper prospect in Western Australia. The project is located just 15 kilometres south-west of the historic Youanmi Gold Mine. Its prospects comprise over five kilometres of heavily underexplored volcanogenic massive sulphide (VMS) trend with an exploration target of 15-20 million tonnes at 2-8% zinc, which also hosts a number of high grade lodes of more than 10% zinc. Recent reconnaissance drilling over the earlier IP anomaly confirmed the presence of significant thick and shallow ‘up-dip’ extension of the known North Dome zinc-copper mineralisation. The drilling currently underway is testing the recently discovered high chargeability anomalies (extends 400m to the south). While this project is the company’s central focus, it’s just one piece of VMC’s exploration pie. The zinc and copper play is one of some five projects that VMC currently has on the go in prime WA mining districts. Adding depth to its portfolio are also two lithium projects, both of which neighbor some major players. VMC’s Greenbushes East tenement is situated on the border of Australia’s largest lithium mine in mining giant Talison Lithium’s Greenbushes Lithium Tantalum Mine, and VMC’s Pilgangoora Northeast project is virtually rubbing shoulders with the $572 million-capped Pilbara Minerals’ (ASX: PLS) Pilgangoora exploration area, which hosts a hefty lithium-tantalum resource. With lithium remaining very much a stock market darling as the ternary battery rally continues to thrive, these lithium projects are right on track. To round things off, VMC also has a large JORC Resourced Vanadium prospect at Youanmi in close proximity to Pincher Well Zinc-Copper Project. 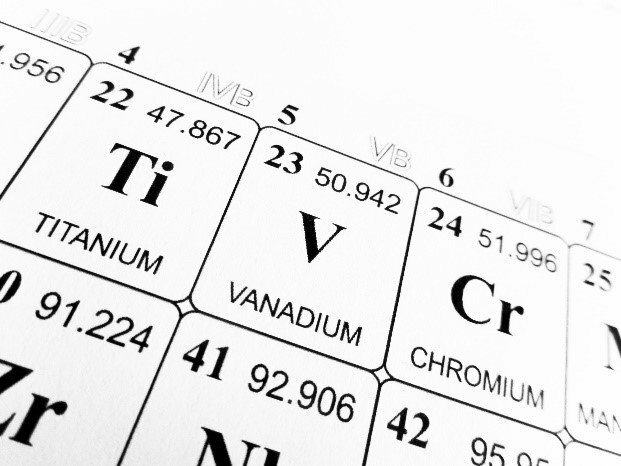 For those of you who might be scratching your heads at this point, Vanadium is a lesser-known ‘super metal’ currently in the throes of a market explosion in light of its recent emergence as a lithium battery ingredient. In short, this $6.9 million-capped ASX junior has a rather strategically mixed commodities cocktail. And it’s searching for these metals is in some of WA’s most prestigious mining districts. We last caught up with VMC not so long ago in our June article, What’s Really Below the Ground at VMC’s Zinc Project? Since then, the company has continued to sharpen its focus and stick to its strategy brief: homing in on its WA projects with a focus on high-performing commodities. 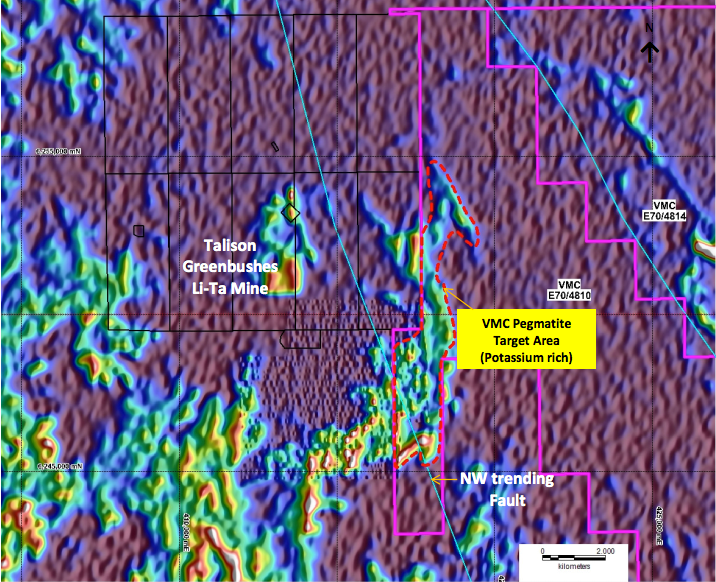 VMC’s Pincher Well tenement is located 600 kilometres northeast of Perth and forms part of the company’s Youanmi project, covering over 730 square kilometres of the Youanmi greenstone belt. 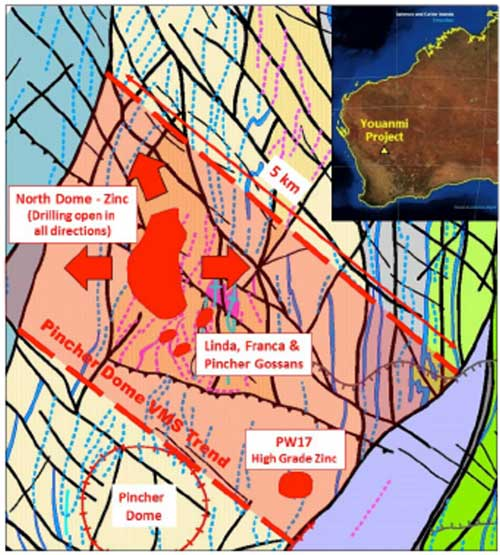 Located 15 kilometres southwest of the Youanmi Gold Mine, the Pincher Dome VMS Trend is more than five kilometres long, and hosts a number of known zinc and copper prospects, including the Linda and Franca Gossans, and a substantial body of zinc mineralisation at North Dome. You can see this mapped out below. The Pincher Dome Trend is a compelling target for classic VMS style base metal deposits, with extensive zinc mineralisation having previously been outlined on the North Dome. Previous drilling has intersected zinc-rich lodes throughout the VMS trend, with accessory copper, gold and silver. The second phase of induced polarisation (IP) surveying has confirmed shallow ‘up-dip’ southern extensions of the North Dome high-grade zinc mineralisation. The modelled anomaly remains OPEN and UNTESTED further to the south, potentially extending the target envelope of 1km strike and 250m width. A detailed ground magnetic survey was undertaken by Magnetic Resources in the Pincher Dome area along 38 east-west lines of 1.8 kilometres length at 50 metres line spacing. The interpretation of this data is in progress. 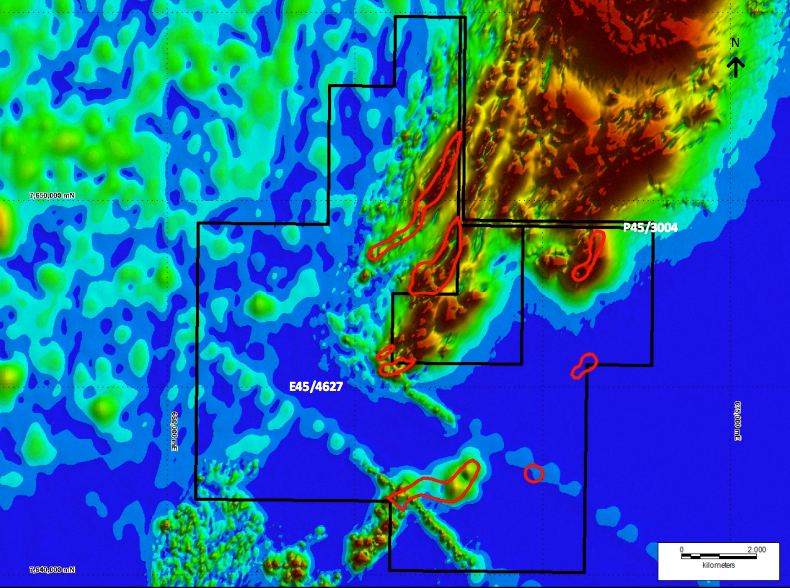 The drilling program that’s just commenced at Pincher Well involves reverse circulation (RC) drilling in the southern target area to test the recently discovered high chargeability anomalies. Interestingly, this is all happening some 15 kilometres south-west away from the existing Youanmi gold mine and processing plant. With myriad historical and ongoing mining operations also in the region, including at Windimurra and Sandstone, the area is very well-serviced and accessible in terms of infrastructure. This will make for some major leverage if VMC can manage to identify a commercial discovery. The overwhelming consensus is that demand for zinc is set to escalate with the closure of some of the world’s largest mines. 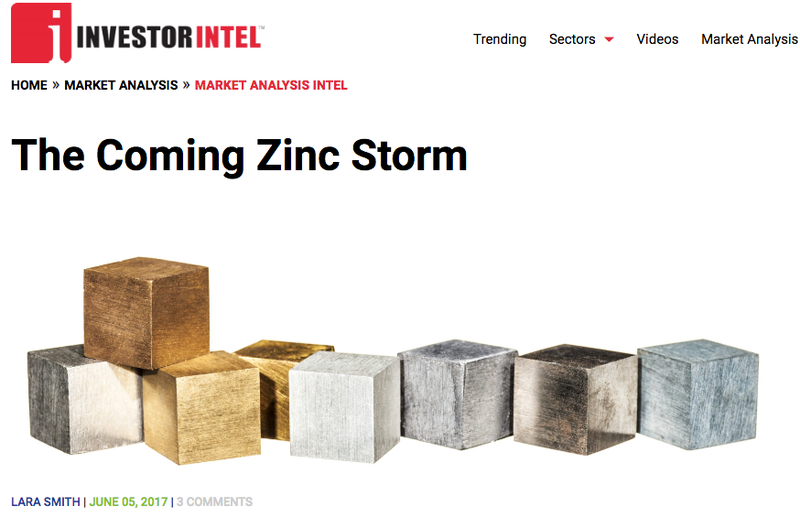 From 2020 onward is set to be the razor edge for the zinc spot price. Of course, commodity prices do fluctuate and caution should be applied to any investment decision here and not be based on spot prices alone. As we continue to charge towards an electric vehicle-powered future, the lithium-ion battery market is as fierce as ever. This ternary battery rally echoes from macro to micro in a wide-reaching way. It’s inescapable. On an international level, big lithium events have included an announcement from the French government that it proposes to ban the sale of petrol and diesel cars from 2040 , a plan by Sweden’s one-time vehicle leader (but now Chinese-owned) Volvo to only make electric or electric-hybrid cars from 2019 , and the launch of the first mass-produced all-lithium-electric Tesla 3 model. 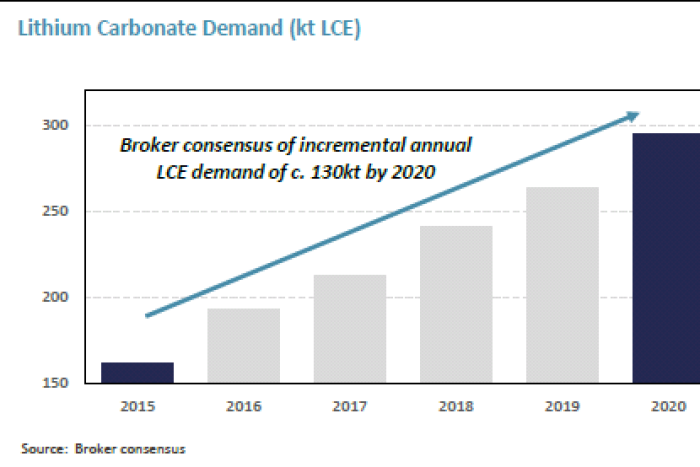 Benchmark estimates prices of lithium carbonate will average $13,000 a ton over the 2017-2020 period from around $9,000 a ton in 2015-2016, and global lithium demand is set to rise 8.9% annually through 2019. It’s safe to say that the booming lithium market, and the electric car revolution on which it rides, is in no danger of slowing down any time soon. In more local news, as car manufacturers across the globe race to meet new EV targets, demand for batteries has driven lithium exports from WA, with the state now producing more than half of the world’s supply. A string of Australian lithium companies, including $570 million-capped Pilbara Minerals (ASX:PLS), whose Pilgangoora deposit is near one of VMC’s lithium prospects, are racing to get their projects into production to meet surging demand. Yet some analysts forecast demand will exceed supply into next decade, even with the new production. It would seem VMC has positioned itself in the right place, at the right time. One of VMC’s lithium tenements, the Greenbushes East tenement , borders mining heavyweight Talison Lithium’s high-profile Greenbushes Lithium Tantalum Mine. Recently a broad potassic-rich area of more than nine square kilometres was identified from regional radiometric data at Greenbushes East. VMC is planning to conduct reconnaissance geological mapping, followed by RAB drilling. VMC’s Pilgangoora Northeast Project spans some 163 square kilometres, and is located 72 kilometres to the southeast of Port Headland in the globally renowned Pilbara region. The project is accessible via the Great Northern Highway, then east along local formed roads and station tracks. This will be advantageous should VMC manage to reach the production stage. As we might have mentioned, the Pilgangoora North-East area, covering 350 square kilometres, is situated near Pilbara Minerals’ Pilgangoora deposit, which is one of the biggest new lithium ore deposits in the world, with a globally significant resource. VMC’s progress here has been tracking nicely. Recent interpretation of regional geophysics data (aeromagnetic and radiometric) over Pilgangoora East and Wodgina South has identified a number of potassic-rich, pegmatite target areas. Intriguingly, a significant potassic-rich trend, identified from radiometric data covering Pilgangoora East, has an identical signature to the lithium-tantalum bearing pegmatites held by Pilbara Minerals and other explorers in the region. 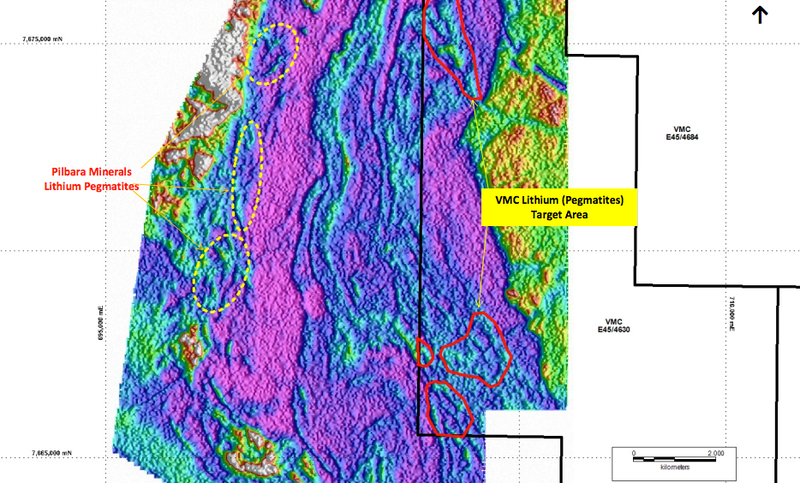 In the figure below, you can see the VMC Pilgangoora East lithium pegmatite target areas. Several new target areas were also delineated from analysis of the magnetic data at Wodgina South, which can be seen below. 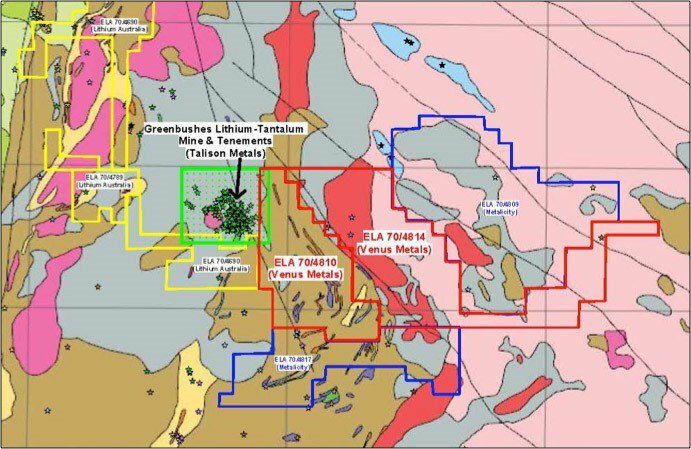 Lithium Australia has plans to conduct a detailed mapping and surface sampling to refine the target locations at Pilgangoora East and Wodgina South tenements. Let’s look now at the final piece of the commodity puzzle: VMC’s vanadium project. Vanadium is an emerging high performer that is poised for what has been described as an ‘explosive’ market. It’s known as a ‘super metal’ used to make steel stronger. And while 90% of vanadium is still used in steelmaking, it also has important application in new batteries which can store large amounts of energy almost indefinitely. In fact, this previously unheralded metal could become a vital part of the renewables revolution. Here Mark Smith, who heads Largo Resources, one of the only vanadium producers in the world, gives a run-down of what vanadium does and what the market looks like. Smith posits that we’re on the edge of ‘something very explosive’ in relation to the metal’s price in response to a rise in demand. That’s because current vanadium supply is failing to meet the rising demand. The considerable interest in vanadium redox batteries for their ability to safely store industrial levels of energy is likely to be a disruptive influence on demand from 2020 onwards. India and China have also emerged as heavy consumers of the commodity in recent years. This resource has been historically drill tested along 3.5 kilometre strike length and has a JORC 2012 Inferred Resource of 330.6 million tonnes at 0.29% V2O5, 5.95% titanium and 19.41% iron. The estimate for VMC was carried out by Widenbar and Associates based on the historical reverse circulation and diamond drill holes. 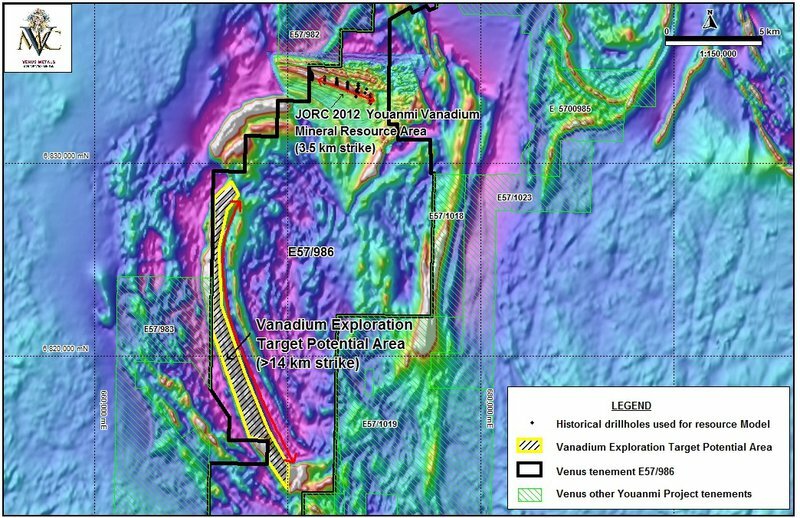 There is considerable upside potential here, with strong geological evidence that the resource continues for many kilometres along strike within the VMC tenements. The company has plans to explore further in the coming months. The Sandstone Gold Project covers over 200 square kilometres of the western margin of the Sandstone greenstone belt, 23 km to the southwest of the town of Sandstone in WA. Historically the Sandstone region has produced in excess of 1.5 million ounces of gold and is well serviced by mining and regional infrastructure. VMC drilled 79 shallow RAB holes in the March quarter totalling 1,671m targeting the previously modelled VTEM anomalies. 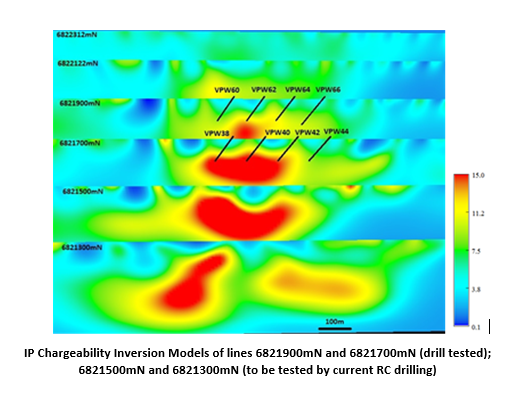 Shallow RAB drilling, with drillhole depths ranging between 6m and 48m, targeted 7 anomalous zones identified from VTEM. Geologically, gold mineralisation appears to be associated with structurally controlled medium to coarse-grained metagabbro as well as banded, ferruginous, meta-chert units. Out of the 79 holes drilled, 20 holes returned anomalous gold values. Two holes gave values greater than 1 g/t. Another six holes had gold values of greater than 0.5g/t at varying depths. The best holes are located within the historical gold trends – Mickey Well Trend and the Bell Chambers-Range View Trend. Preliminary analysis of the assay results shows the potential extensions of the historically known resources. The assay results confirm the occurrence of gold mineralisation at shallow depth in selected VTEM anomaly areas and warrant additional RC drilling to test this mineralisation to depth. With its diversified array of projects and multi-commodity focus, it’s clear that VMC understands the delicate art of balance. Of course, VMC does remain a speculative stock, so investors should seek professional financial advice if considering this stock for their portfolio. If this $7.69 million-capped ASX-listed company can continue to generate positive news flow from across its portfolio of precious and base metal projects in WA, we could see some considerable share price catalysts in the coming months. With drilling currently underway at its Pincher Well project and plans to also commence drilling elsewhere in the near future, exploration success is certainly possible. Here at the Next Small Cap , we’ll be sure to keep you well in the loop as it unfolds.